O&G Industries, Connecticut’s largest privately-held construction company and an ENR Top 100 Green Building Contractor, in partnership with the Orville H. Platt High School Career Center, kicked off the 4th annual PlattBuilds program on September 28th. 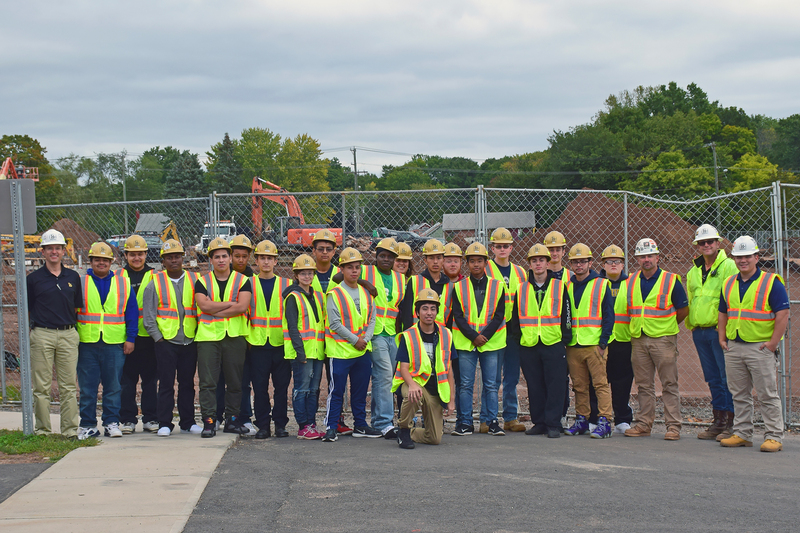 Twenty-three members of the Platt student body, including five returning students, are participating in the nine-month long experiential learning program in which high school students earn credits while learning hands-on about careers in construction. As a part of the program, students get a behind the scenes look into the construction of their school, while engaging in interactive lectures from the project management team, design team and trade contractors as the project moves through the final phases of construction. The PlattBuilds program has been recognized with the Connecticut Construction Industries Association (CCIA) Community Service Award in 2014 and the Midstate Chamber of Commerce Recognition for Business & Education Excellence in 2015. To date, forty-six students have graduated from the program at Platt High School since its inception in 2013.